Mary Wollstonecraft died a few days after giving birth to her daughter, Mary Shelley. Yet, even from beyond the grave, she played a big part in her daughter's upbringing and had a big influence on her beliefs and decisions. Both women made similar choices, suffered similar tragedies, and were sustained throughout all their hardships by their dreams of improving women's conditions through their writings. Both Marys were intelligent, talented women that struggled to achieve independence in a world where women were considered the properties of their fathers and husbands, meant to serve and obey, not to lead and work. They both became famous writers, penning books and essays that highlighted their political convictions and the evils of society. They fell in love with men who broke their hearts. They had children out of wedlock. They both lived abroad, Wallstonecraft in Paris during the Revolution and Shelley in Italy with her husband Percy, the infamous Lord Byron and their circle of scandalous friends. They broke every social convention of their time. "Not only did they write world-changing books," Gordon writes, "they broke from the strictures that governed women’s conduct, not once but time and again. Their refusal to bow down, to be quiet and subservient, to apologize and hide, makes their lives as memorable as the words they left behind". Their refusal to bow down to the dictates of society and their determination to remain true to themselves and their beliefs, no matter what, made them what Wollstonecraft termed "outlaws". In Gordon's hands, both women, with all their strengths and flaws, talents and dreams, vividly come back to life again. So does the world they inhabited, with all its strict rules and social conventions, and the ostracism it inflicted on those who dared break them. Put into context, their achievements in overcoming the many hardships, prejudices, and insults they faced, are even more astonishing and remarkable. Their stories are told in alternating chapters. Gordon dedicates one chapter to each woman at a similar period in her life, so we are always going back and forth between them. I thought this would be confusing, but it wasn't at all. Each chapter is named after the Mary it is dedicated to, the years it covers, and the most important events that occurred in that period. Besides, despite their many similarities, their lives were different enough to allow readers to always easily distinguish between the two Marys. 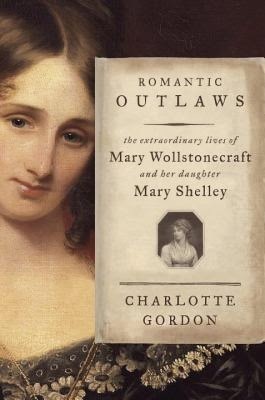 Well-researched and beautifully written, Romantic Outlaws: The Extraordinary Lives of Mary Wollstonecraft and Her Daughter Mary Shelley hardly reads like a biography at all. It is a very enthralling read, sometimes utilizing fictional devices such as cliffhangers to keep readers interested and engrossed. You just won't be able to put it down. Well-researched and beautifully written, Romantic Outlaws: The Extraordinary Lives of Mary Wollstonecraft and Her Daughter Mary Shelley tells the story of two remarkable women who have defied conventions to remain true to themselves and used their talents to improve the conditions of women in society. Enthralling and engrossing, you won't be able to put it down.